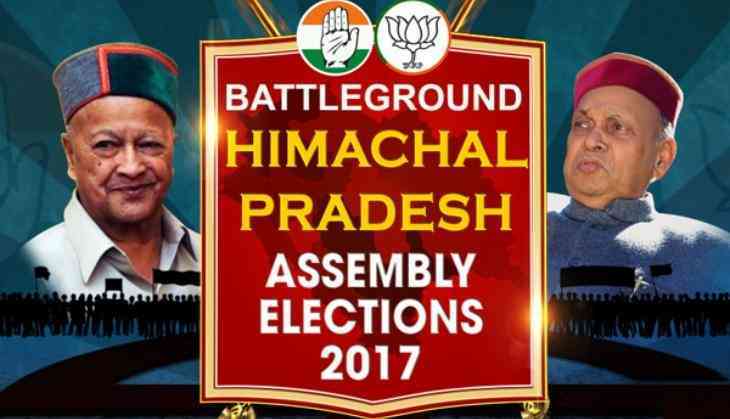 More than 50 lakh people of Himachal Pradesh will today cast their votes to decide the fate of some of the biggest leaders of Indian democracy. The Congress Party and the Bharatiya Janata Party (BJP) are contesting all 68 seats, while the Bahujan Samaj Party (BSP) is contesting 42 seats, followed by the CPI(M) 14, Swabhiman Party and Lok Gathbandhan Party six each and the CPI-3. Talking about the Chief Ministerial candidates, Congress leader and six-time Himachal Pradesh Chief Minister Virbhadra Singh is fighting against BJP's Prem Kumar Dhumal, two-time Chief Minister of the state. Dhumal, who left his stronghold constituency of Hamirpur, is now pitted against Congress' Rajinder Rana in Sujanpur. Once an independent candidate, Rana won the 2012 elections in the state from Sujanpur constituency on his own before shifting to Congress. Things are not greener on the other side as well. As 83-year-old Singh, the longest serving Chief Minister of India, is contesting for a place in the 68-member legislative assembly for one last time, having announced his pre-planned retirement to the public. The Chief Minister in the incumbent Congress government left his constituency seat in Shimla for the political debut of his son Vikramaditya Singh, while risking his victory in Arki, a stronghold of the BJP. Himachal Pradesh Youth Congress President Vikramaditya Singh, who is contesting from his father's maiden seat, will face BJP's Pramod Sharma, another strong contender in the polls. In another interesting competition in Palampur, Congress' candidate Praveen Sharma, a rebel BJP leader is contesting against the party's candidate Indu Goswami, who if reports are to be believed, has been handpicked by Modi. The BJP too gave tickets to four rebel Congressmen, including former minister Anil Sharma. Chief Parliamentary Secretary Mansa Ram, elected for the first time from Karsog in 1967, is in the fray for the eleventh time. At present, the Congress and the BJP have 35 and 28 MLAs respectively in the 68-member House. Four of the remaining five seats belong to independents, while one of them is vacant. The results of the polling will be announced after 40 days on December 18, in line with those of the Gujarat polls, scheduled in two phases for next month.